I’ve become a regular at Lion Bridge as I had been spending a decent amount of the month of July at St. Luke’s hospital for a family emergency. And though I always intend to spend dinner time at a Subway or even do the unthinkable and eat the hospital food with my “free” meal pass, I always took that time and wandered around the downtown Cedar Rapids area. Many stops at Batas (review to come), beers at Parlor City, a buffalo chicken wrap at Bricks, and then the majority of my stops would always conclude at Lion Bridge Brewery in the Czech Village. I’ve enjoyed many of the beers here, the smoked chocolate stout on Nitro, the Ziva Voda, the new double IPA, El Doble has quickly become a favorite but I was really impressed with Quinton’s new saison style brew called Whirligig. I know saisons are not a style for everyone, but I do think they are climbing the ladder into the niche market of double ipas, barrel aged anything, and sours. The first flavor I experienced from this brew was a bazooka like bubble gum flavor followed nicely by the mild tart and bitterness. A really refreshing brew that I intend to have growlers of during the Iowa Hawkeye football season to enjoy. Almost seemed like a mix of a saison and an American wheat brew. Very drinkable and very tasty! 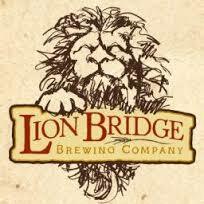 Not only is Lion Bridge doing great things beer related, their kitchen also impresses. Locally made sausages, meat and cheese plates, pulled pork nachos (fantastic! ), reuben fritters, and muffaletta fingers make fantastic companions to the beer that flows through this brewery. The staff is always friendly and accommodating and the brewer is usually on hand happy to have a conversation with you. If in the area check this place out, grab a growler and enjoy! POUR: Hazy yellow pour, nice white head. AROMA: A little barnyard, lemon, grass. TASTE: Bubble gum, lemon, grassy notes. My recommendation:Between Lion Bridge and Big Grove, you’ll usually can find the Baron at one of these locations! Bikes and Brews with Boulevard; Sat. August 16th!